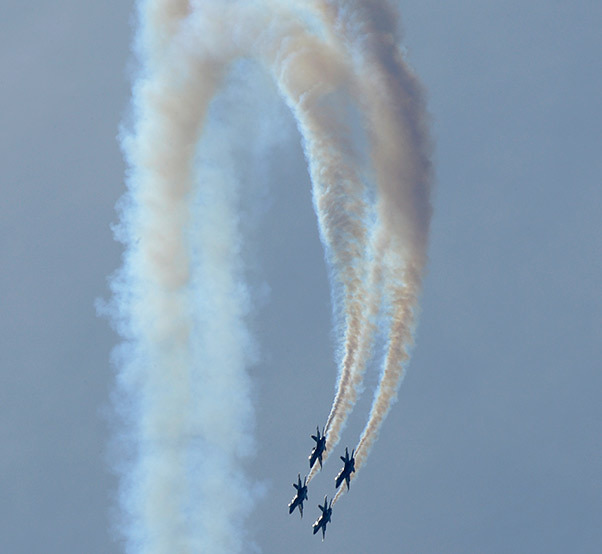 The Chief of Naval Air Training also selects the “XO,” the Blue Angels executive officer. The XO is a Naval Flight Officer and must have at least 1,250 tactical jet flight-hours. 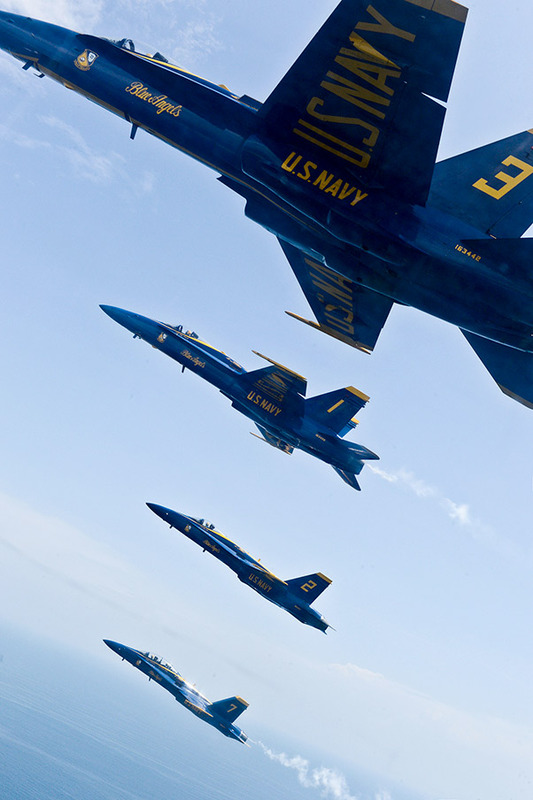 Career-oriented Navy and Marine Corps jet pilots with an aircraft carrier qualification and a minimum of 1,250 tactical jet flight-hours are eligible for positions flying jets Number 2 through 7. The Events Coordinator, Number 8, is a Naval Flight Officer or a Weapons Systems Officer who meets the same criteria as Numbers 2 through 7. The Marine Corps pilots flying the C-130T Hercules aircraft, affectionately known as “Fat Albert,” must be aircraft commander qualified with at least 1,200 flight hours. 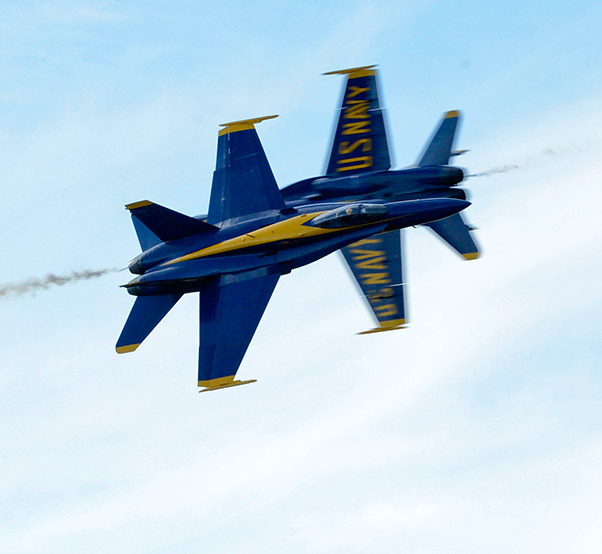 In 2016, the Blue Angels will celebrate their 70th anniversary. 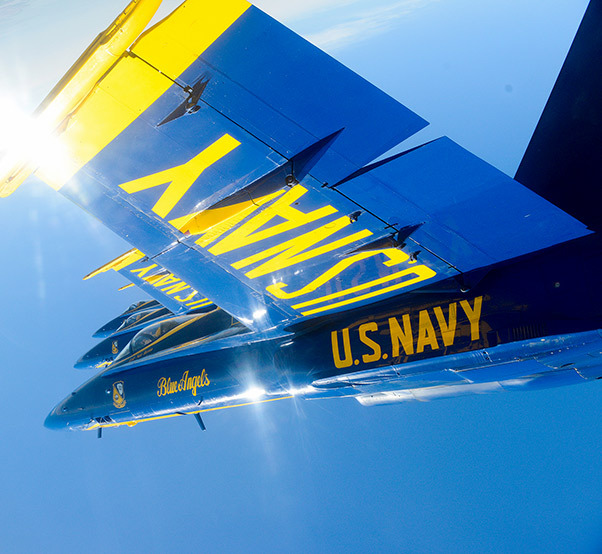 Since 1946, the Blue Angels have performed for more than 484 million fans. 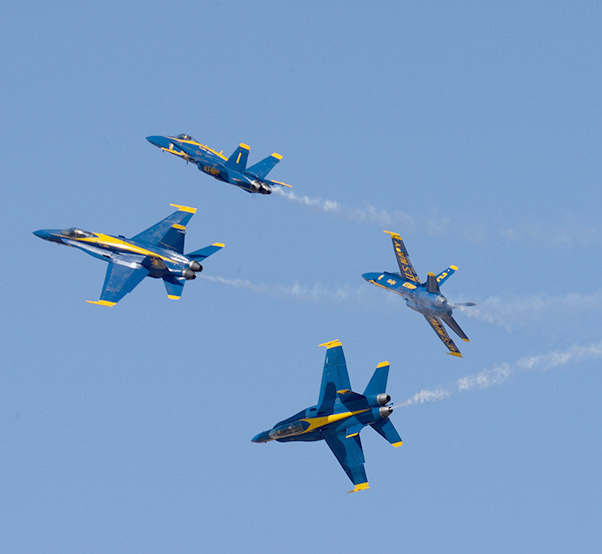 The Blue Angels have flown more than 10 different aircraft in the team’s 70 year history. 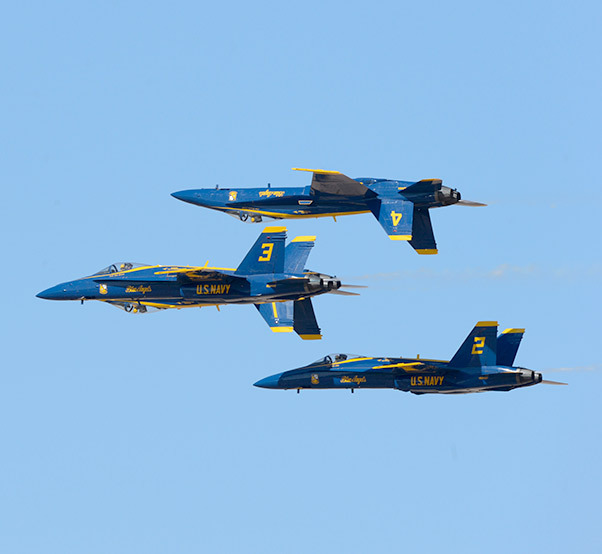 Originally, the team flew four aircraft in the signature “Diamond” formation and expanded to six aircraft to showcase both the diamond and solos high performance capability as well as the precision formation flying taught to all Naval Aviators. Today, the squadron flies the Boeing F/A-18 Hornet and the Lockheed Martin C-130 Hercules. 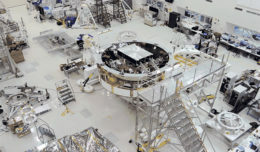 When the squadron receives a F/A-18 Hornet from the fleet, which are at the end of their carrier arrestment functionality, we make a variety of modifications, including removing the nose cannon to install a smoke-fluid system, inverting a fuel pump, installing a stop watch and adjustable constant-tension stick spring, as well as the world-wide recognizable paint scheme. The first Jet-Assisted Take-Off (JATO) performance by “Fat Albert” took place at Naval Air Station Pensacola, Fla., in November 1975. Eight solid fuel JATO rocket bottles, each producing 1,000 pounds of thrust, helped propel Fat Albert skyward and captivated millions of spectators each year. These JATO bottles were produced in the Vietnam era to help aircraft take off from short, unimproved runways at heavy weights. 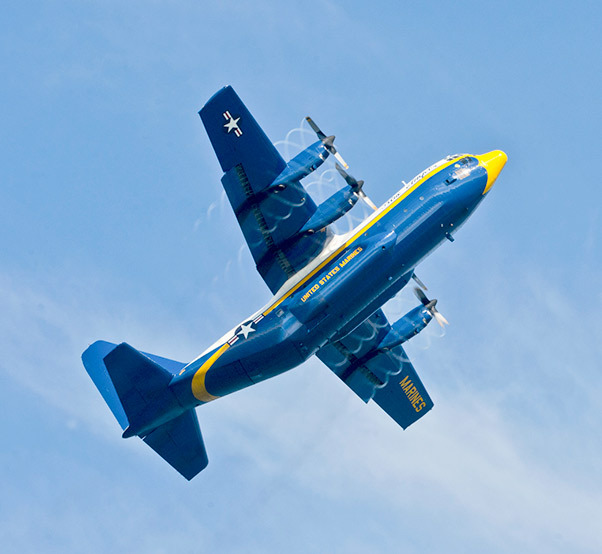 The last known stockpile of JATO bottles were expended during the Blue Angels’ 2009 show season and ended with the last JATO performance for Fat Albert at the NAS Pensacola, Fla., Air Show in November 2009.